The methods of moving between states and navigating within the psychic and spiritual worlds vary enormously. Here the author hopes to provide a sampling of the various methods used to successfully change states while doing spiritual travel. Most of the following deal with altering lucid dream environments. This activity is a natural first step to overcoming the limitations of the dream state in preparation for more advanced forms of spiritual travel. Visualization of specific images can have a similar effect. One practice illustrating such visualization is described briefly on the Tibetan Dream Yoga page. This page illustrates an Eastern method but the Christian traveler can as easily practice the visualizations from the Spiritual Exercises of Saint Ignatius of Loyola or visualize images from Ezekiel's vision of heaven from the Hebrew Bible. One of the functions of a spiritual practice is to create these spiritually charged symbols (prayers, mantras, or religious imagery) so they can be used effectively to direct the soul towards spiritual states when the opportunity arises during spiritual travel. 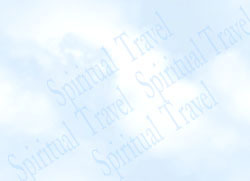 Spiritual travel provides a unique means and opportunity to explore transcendent states of consciousness but it is the traveler's religious system that determines the spiritual destination or goal of spiritual travel. The best way to navigate is to have a guide that knows the territory who will assist the traveler, but this is not always possible. However there are also advantages to discovering things for oneself, since it makes the traveler more independent and capable of standing on his or her own. It is good idea to be open to accepting guidance and even to mentally invite helpers or guides who can assist you if you get into difficult situations while doing spiritual travel. Doing some meditation specifically asking for help and guidance is excellent preparation for spiritual travel. When traveling, though helpers may be unseen, that does not mean that they are not present and able to assist the spiritual traveler when called upon to do so. Here are some simple methods that can be used to break out of or increase freedom in a lucid dream environment. We normally believe that matter obeys certain laws, and breaking those laws is a means of breaking out of a common lucid dream state. Simple spiritual practices such as mantra meditation can have dramatic effects when practiced during spiritual travel when the same practice will have little or no effect when done during normal meditation. Flying, while not an advanced spiritual state, can be one of the joyous and liberating aspects of spiritual travel for the beginner. Skipping is the process of using mental expectations to change environments during spiritual travel.